Well, to be honest, there is a mood of tentative optimism in Issue 71 of the MFE. We give a cautious review of the new owners’ work to date, whilst mourning the loss of Will Grigg and extol Reece James to the highest virtue. There’s a piece on walking football, the travels of The Alfie Lund Fund, World Cup commentators of years gone by and collecting elusive programmes. Plus there’s more offbeat stuff about musical genres, Blue Coats school and rubbish graffiti (now there’s a surprise!) and the possible motives behind doing such a thing. 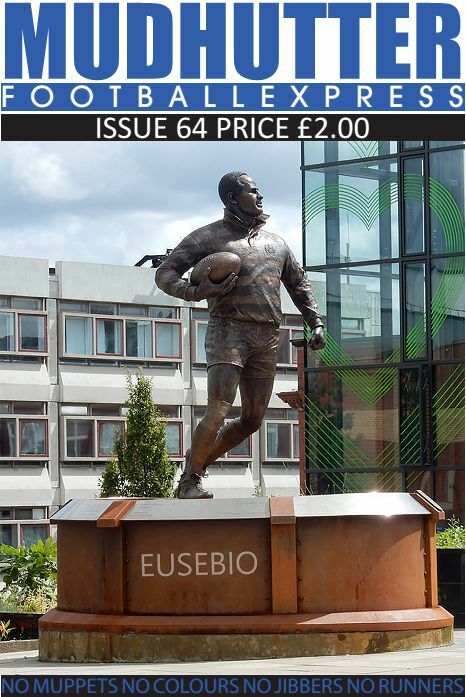 It’s priced at just two quid as usual and you can pick up one before the game tomorrow, on the bridge or outside Rigalettos. 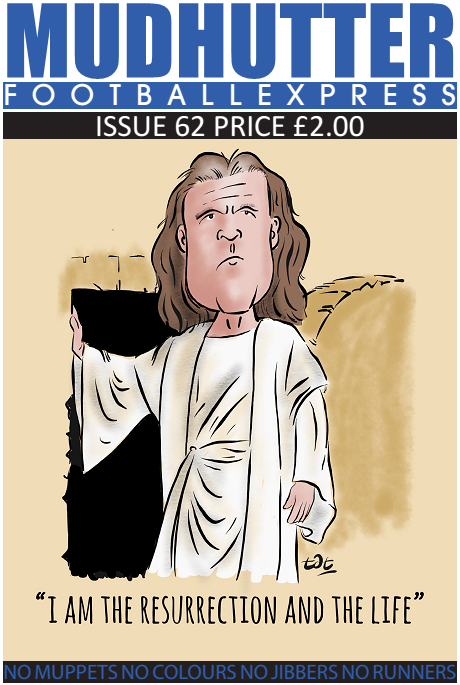 It will also be on sale in all the usual stockists by kick off time. Want to buy it online? Then get yourself a pristine copy delivered to your door, clad head to toe in PVC. Seasonal scribblings from all at the Mudhutter! 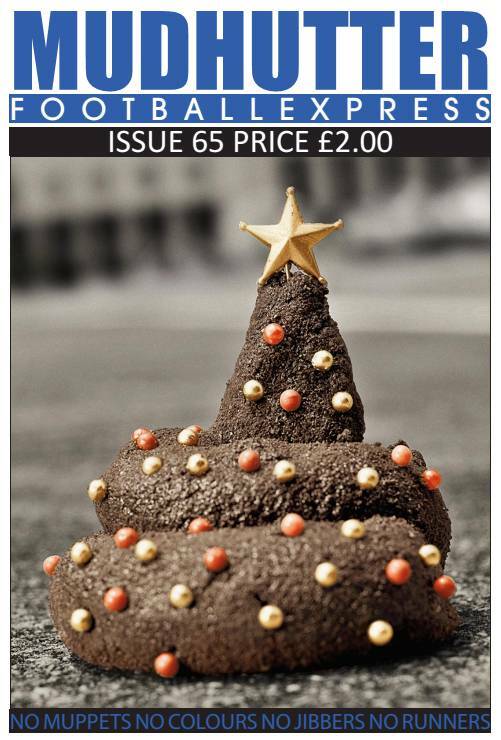 Mudhutter issue 70 is out this weekend, and it’s a marginally festive plethora of home grown independent writing and stuff. Weighing in at a meaty 48 pages for just two quid, we’ve got plenty of new and regular articles and features for you to read when you’re tucked up early in bed on cold winter’s evenings. We take a look at the outgoing Whelan era and the new IEC takeover. There’s Christmas and Formula One (No! Come back!!) and we’ve got the inside scoop for the new plans for Sharpy’s chippy. There’s plenty of festive fun and ruminations of worst ever away games, plus in order to do our bit for Diversity & Equality, we’ve actually had a girl write an article for us! I know! What would Malky think? 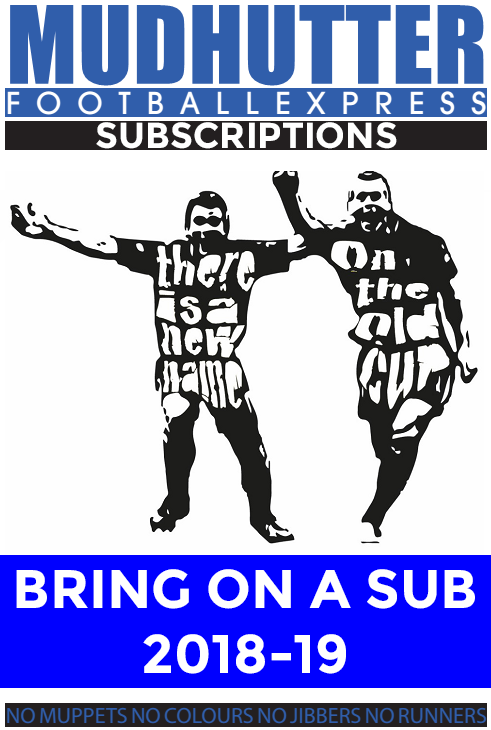 Yes, we are back with another dose of comedy, nostalgia, football comment and all the other rubbish, Wigan Athletic and otherwise, filling our time writing inane gibberish until we can crack open the Quality Street tin and have a mince pie. There’s lots of stuff about the takeover, the infamous red button and an appreciation of Paul Cook. Plus, there’s a walk down Springfield Road, a review of the Walk4Joseph walk and a preview of what’s next, golf (no, come back). Further afield, we look at the somewhat diverse footballing mix of Hadjuk Split, Chester FC and Fiorentina plus there’s all your favourite features from all our regular contributors. Yes, including THAT one. 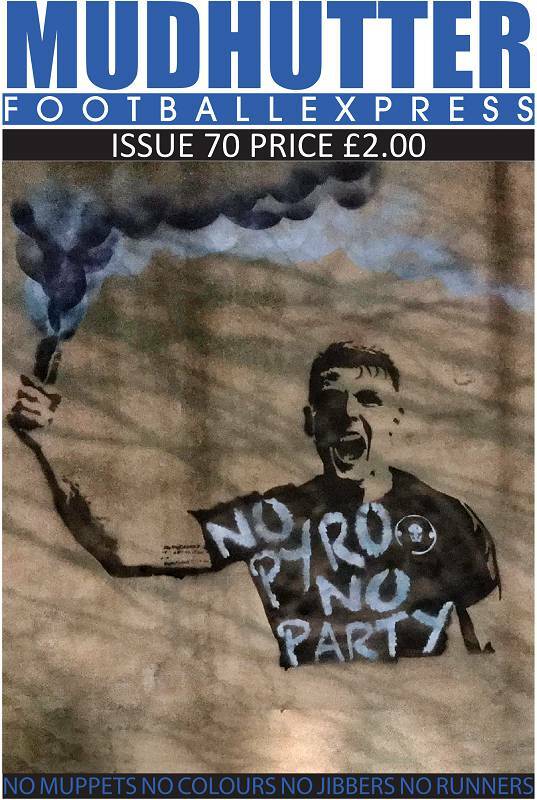 We’ll be selling on the bridge and opposite Rigalettos before the West Brom game on Saturday and it will be in all the usual stockists: Sparks Newsagents, Waterstones, Wigan Central, The Brickmakers Arms, Mesnes Road News and the Northern Beer Temple. 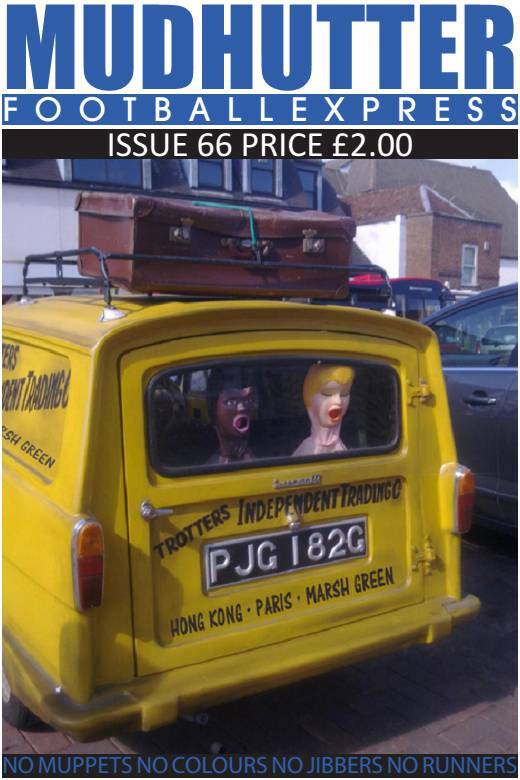 Oh, and as a special treat, you can now get 25 past issues for just a tenner, delivered right to your door! With many thanks to our valued readers, customers and all those folk who don’t buy it but still demand a free nod off us as they walk past. In this issue of the Mudhutter, we look at a great many things indeed. Mainly, though, we look at why some our fans are basically just massive moaners. We can only assume they enjoy it, but who really knows? You can see what else our wonderful team of contributors have got to say for themselves by buying the mag in print or digital format. Want to know how? Here at Mudhutter, we’ve just about sobered up to produce the goods again and we’re hoping the lads on the pitch can do the same for the last two games. And with that, we are proud to announce that our latest edition is hitting the streets this weekend *sound of boxes thudding on the floor*. In this issue, we take a more in-depth look at the possible ramifications of a takeover and whether it will actually happen. 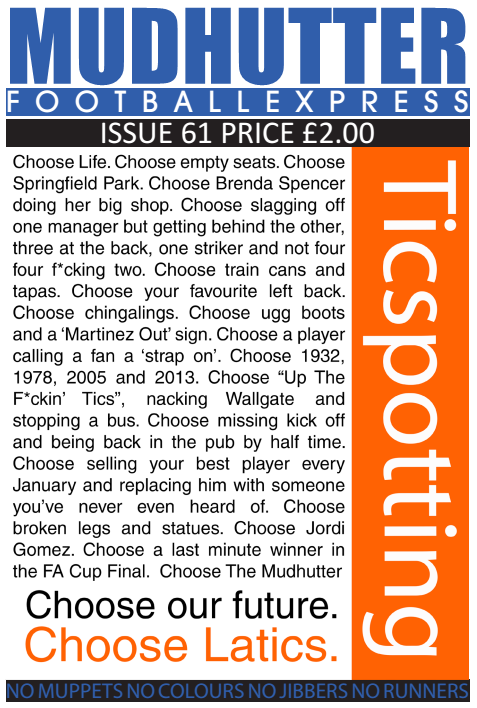 Plus we questions the merits of a loyalty scheme and get all X Factor over our terrace chants. Les Bagg is on fine form, bringing us right up to date with current games and there’s a look at just what makes Wigan Athletic so unique. Elsewhere, there’s a not so glowing review of going fishing, dangerous theme parks and some ace cartoons, plus all the usual regular features. Well, most of them. We’ve got 40 pages of love, lingering and laughter to bring to you priced, as ever, at just £2.00. We will be selling at the game tomorrow in the usual spots and it will also be plonked in our stockists later today including Waterstones, Sparks, Mesnes Road News, Wigan Central, The Brickmakers, Northern Beer Temple and probably one or two other places I’ve forgotten already. Once again, we’d like to thank everyone who has bought or contributed to the Mudhutter again this season and we’ll see you in August! 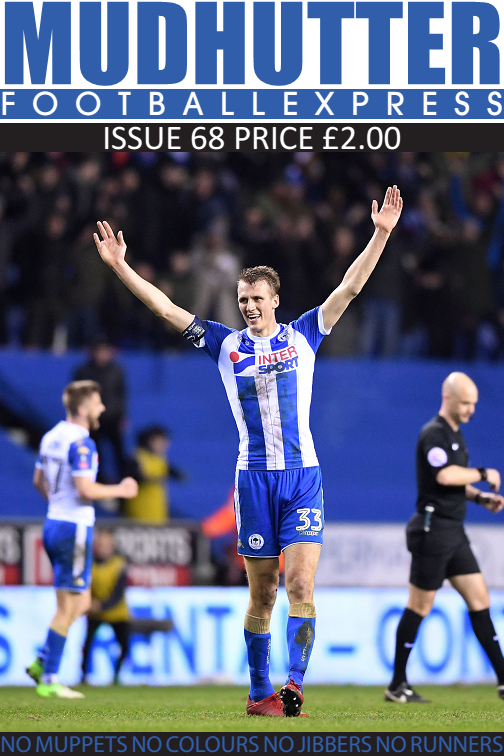 Mudhutter issue 66 hits the streets this weekend, and with it being Issue 66 and 666 being the sign of the devil, we work ourselves up into a fume over 66 people who have crossed us and the fine establishment that is Wigan Athletic Football Club. We uncover the real reasons why Nick Powell stayed, what happened when the World Cup disappeared, the relegation hangover effect and we take a cautious look at our new owners. Plus there’s the obvious articles you’d usually find on topics such as canal barges, fighting the Vietcong and getting drunk on trains. 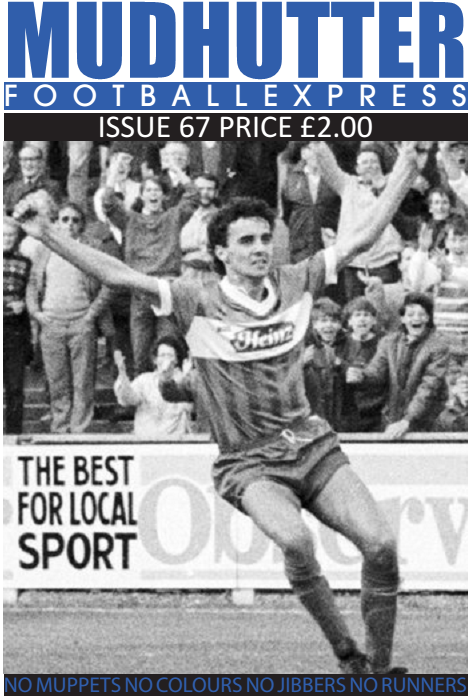 And all your regulars: Bagg, Tat, Topping, Livesey, Talking Sport in your all new 44 page Mudhutter. 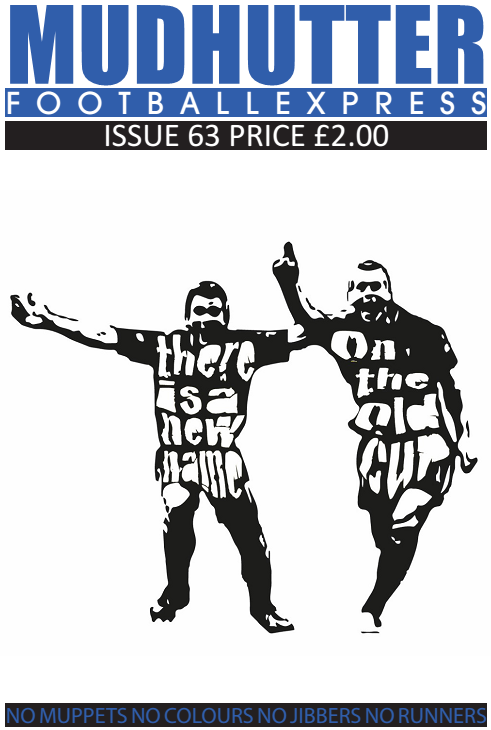 On sale here or from all your usual stockists and we’ll be selling before the City cup game and also Rochdale at home. 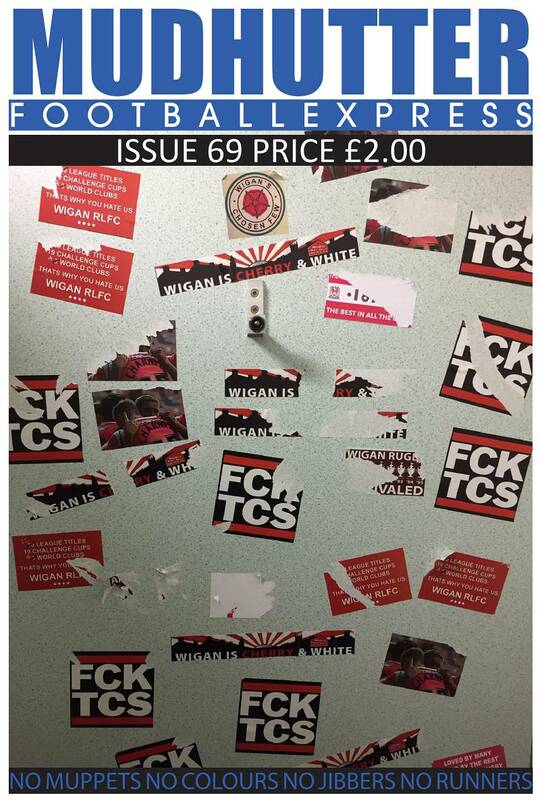 Last time we were 2nd, at the time this issue hits the streets, we’re top of League 1. We’re also (just) still in the FA Cup, with a replay against AFC Fylde to come and a trip to Bournemouth in the next round if we manage to finally put our close(ish) neighbours away. Whatever happens, we hope you all have a nice Christmas, and we’ll see you in the new year. As we go to print, we lie 2nd in the table and, by the time Saturday at 5 o’clock comes, we might well be top. That fact has probably contributed to the rather confused feelings of our writers in this issue, who don’t seem to know whether we’re a decent team or whether everybody else is awful. After we’d gone to print, we were saddened to learn of the death of Ian McNeill, the manager who brought us into the Football League in 1978, at the age of 85. Without him, our years in the Premier League, and our FA Cup win in 2013 might well never have happened. Our sincere condolences go to Ian’s family and friends, and we truly have lost a club legend. It’s somewhat appropriate that Ian was born in the year Wigan Athletic Football Club was founded. RIP. You can buy the mag here. Yes, another season brings another Mudhutter. MFE 63 has a mix of blind optimism and unrelenting misery. As we go to press, we’ve won both competitive games so far, with a win away at MK Dons and at home to Blackpool in the League Cup. In case you were wondering, we never win our first two games in a season. With that in mind, we wished we’d bit a bit more upbeat with this issue but, well, that wouldn’t be us, would it? So, off you go and BUY THE MAG. You can also get digital and print back issues. It’s that time again, time for another Mudhutter to hit the streets. And as ever, we give you an irreverent mix of the past, present and future. There’s certainly plenty of deliberation as to how we’ve got to where we are and what the landscape may look like next season. We also take a look at other subjects as random as Sir Bradley Wiggins, Steely Dan and 1874 Northwich, plus we look at what we’re expecting from candidates hoping to fill the privileged role of being the next manager of Wigan Athletic. Plus there’s the usual regular features: Bagg, Topping, Tat and the usual generous serving of p1ss taking and p1ss boiling spewing forth from Mudhuts Towers. Well, would you expect anything else? 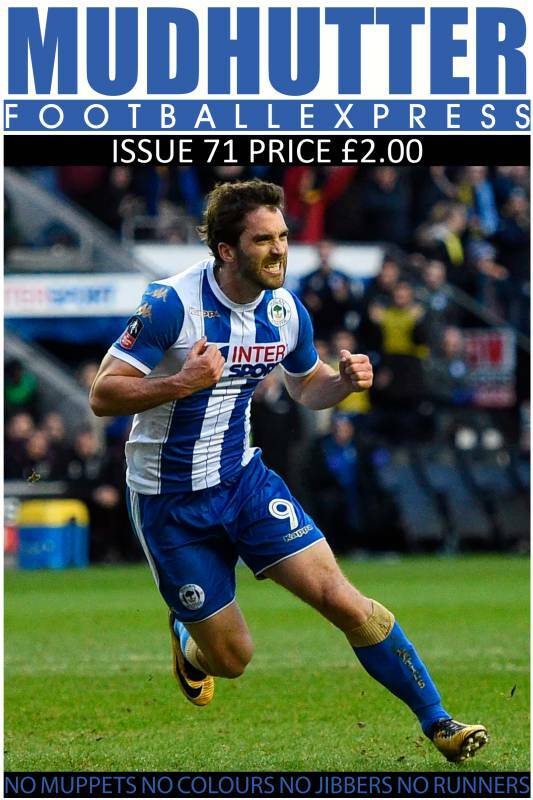 We’re selling at the ground on Saturday before the game in our usual spots and there will be copies in the usual stockists at some point over the weekend: Sparks Newsagent, Waterstones, Brickmakers Arms, Mesnes Road and the Northern Beer Temple. Yes, we’re passed the age at which women used to be allowed to retire, and yet we’re still going strong. Ish. A surprisingly upbeat issue, all things considered. It would have been positively euphoric had we not gone to press just before we managed to beat Wolves away. Go on, buy it, you know you want to.